How can I visualize individual and multiple bands in a raster object? 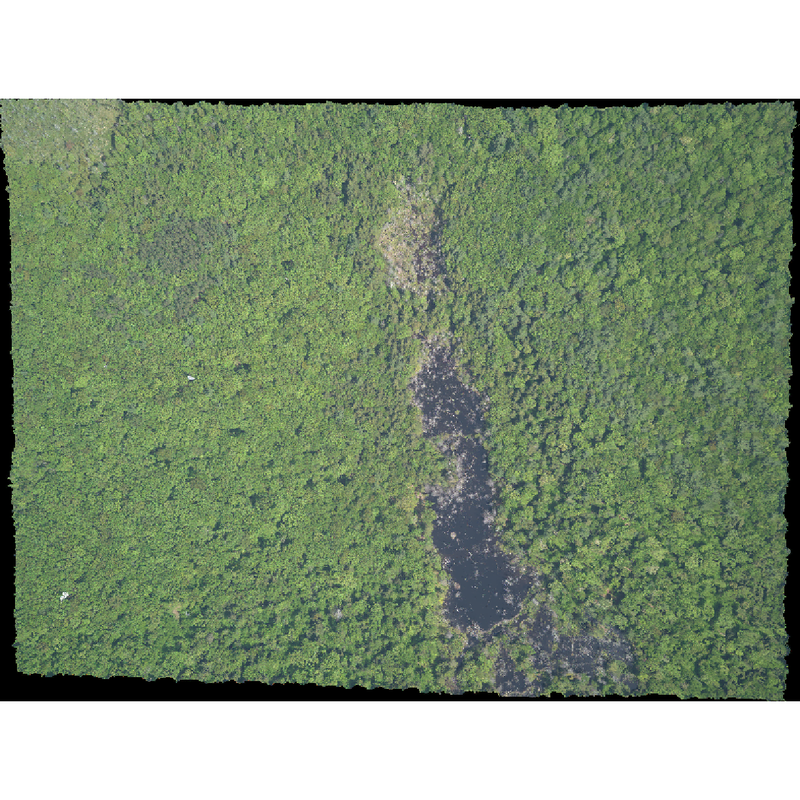 Identify a single vs. a multi-band raster file. Import multi-band rasters into R using the raster package. Plot multi-band color image rasters in R using the ggplot package. We introduced multi-band raster data in an earlier lesson. This episode explores how to import and plot a multi-band raster in R.
In this episode, the multi-band data that we are working with is imagery collected using the NEON Airborne Observation Platform high resolution camera over the NEON Harvard Forest field site. Each RGB image is a 3-band raster. The same steps would apply to working with a multi-spectral image with 4 or more bands - like Landsat imagery. If we read a RasterStack object into R using the raster() function, it only reads in the first band. We need to convert this data to a data frame in order to plot it with ggplot. View the attributes of this band. What are its dimensions, CRS, resolution, min and max values, and band number? 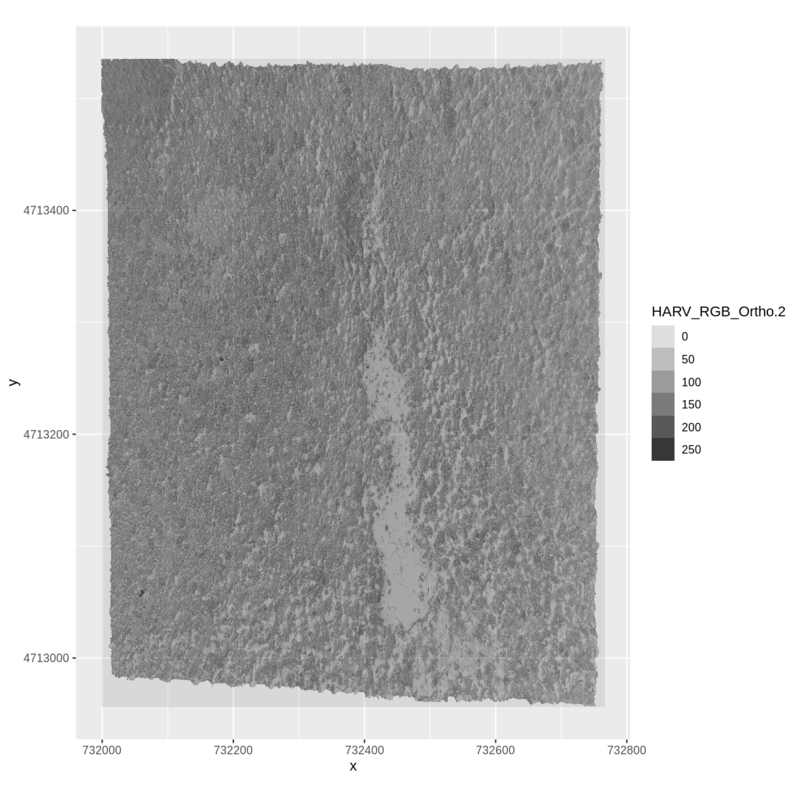 This is R telling us that this particular raster object has more bands (3) associated with it. The number of bands associated with a raster object can also be determined using the nbands() function: syntax is nbands(RGB_band1_HARV). As we saw in the previous exercise, this raster contains values between 0 and 255. These values represent degrees of brightness associated with the image band. In the case of a RGB image (red, green and blue), band 1 is the red band. When we plot the red band, larger numbers (towards 255) represent pixels with more red in them (a strong red reflection). Smaller numbers (towards 0) represent pixels with less red in them (less red was reflected). To plot an RGB image, we mix red + green + blue values into one single color to create a full color image - similar to the color image a digital camera creates. We can use the raster() function to import specific bands in our raster object by specifying which band we want with band = N (N represents the band number we want to work with). To import the green band, we would use band = 2. Compare the plots of band 1 (red) and band 2 (green). Is the forested area darker or lighter in band 2 (the green band) compared to band 1 (the red band)? We’d expect a brighter value for the forest in band 2 (green) than in band 1 (red) because the leaves on trees of most often appear “green” - healthy leaves reflect MORE green light than red light. Next, we will work with all three image bands (red, green and blue) as an R RasterStack object. We will then plot a 3-band composite, or full color, image. To bring in all bands of a multi-band raster, we use thestack() function. 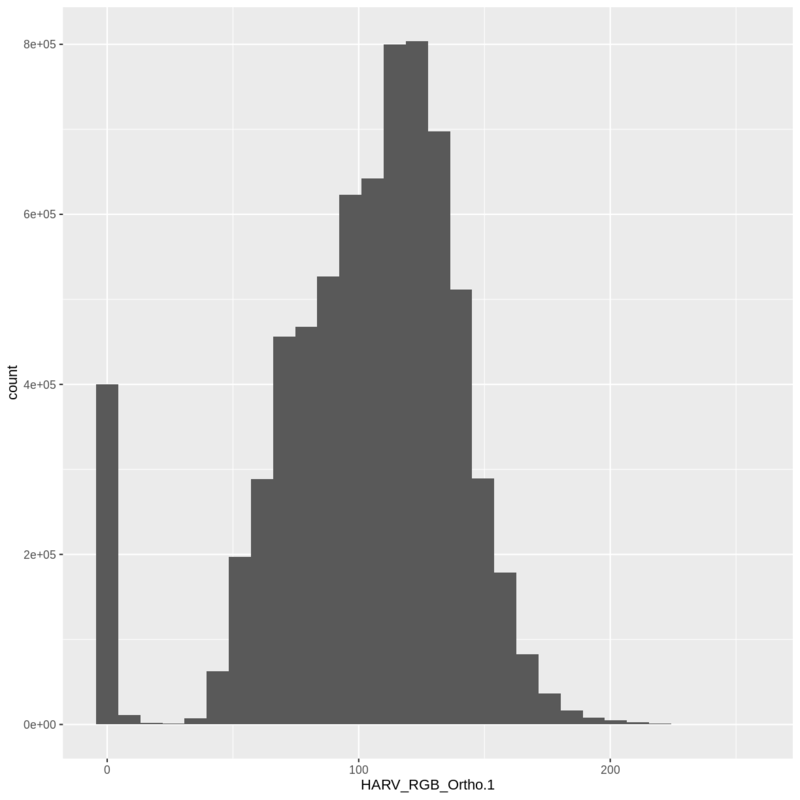 We can also use the ggplot functions to plot the data in any layer of our RasterStack object. Remember, we need to convert to a data frame first. We can access any individual band in the same way. To render a final three band, colored image in R, we use the plotRGB() function. Identify what bands we want to render in the red, green and blue regions. The plotRGB() function defaults to a 1=red, 2=green, and 3=blue band order. However, you can define what bands you’d like to plot manually. Manual definition of bands is useful if you have, for example a near-infrared band and want to create a color infrared image. Adjust the stretch of the image to increase or decrease contrast. Let’s plot our 3-band image. Note that we can use the plotRGB() function directly with our RasterStack object (we don’t need a dataframe as this function isn’t part of the ggplot2 package). The image above looks pretty good. 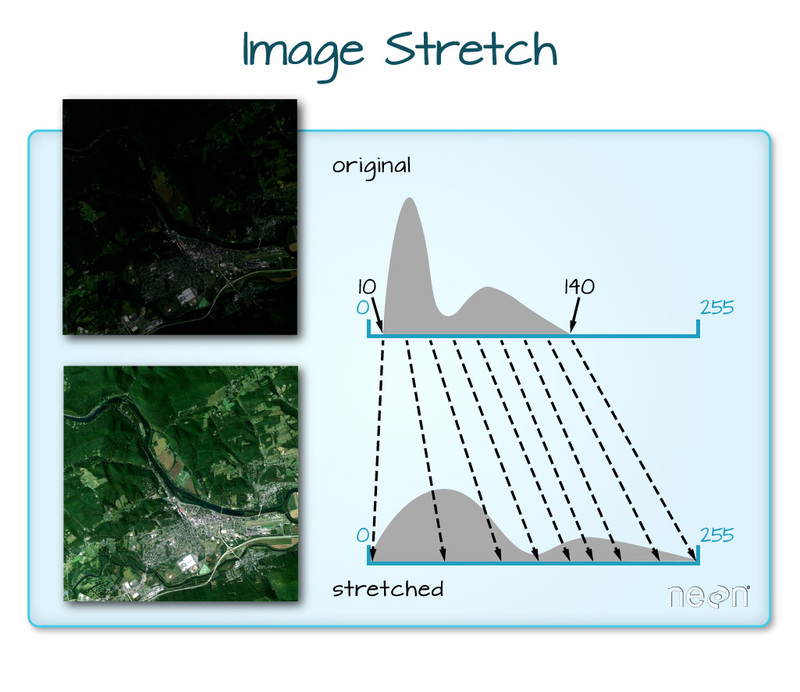 We can explore whether applying a stretch to the image might improve clarity and contrast using stretch="lin" or stretch="hist". 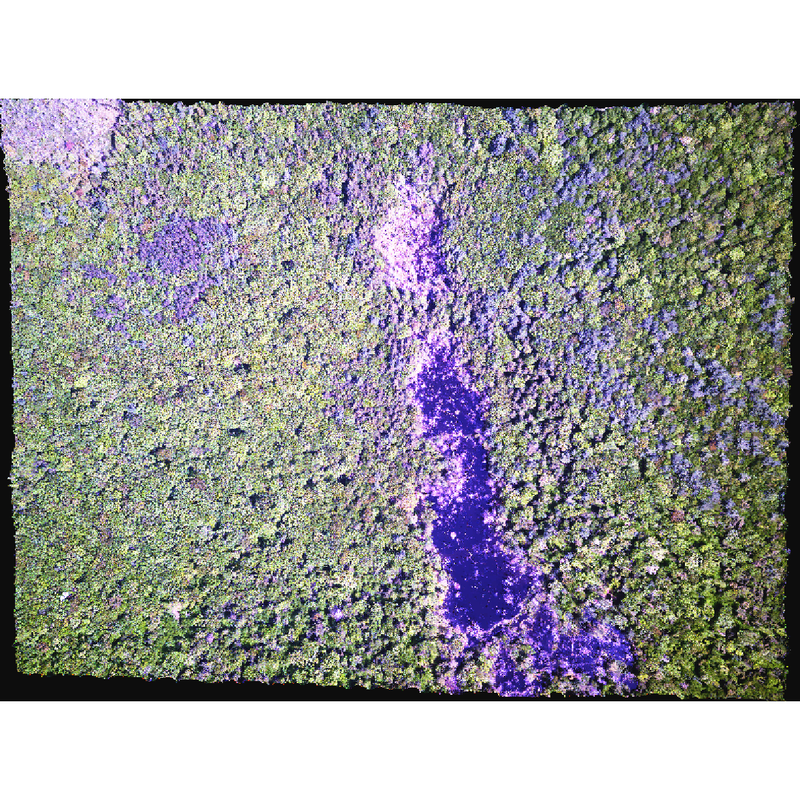 When the range of pixel brightness values is closer to 0, a darker image is rendered by default. We can stretch the values to extend to the full 0-255 range of potential values to increase the visual contrast of the image. When the range of pixel brightness values is closer to 255, a lighter image is rendered by default. We can stretch the values to extend to the full 0-255 range of potential values to increase the visual contrast of the image. 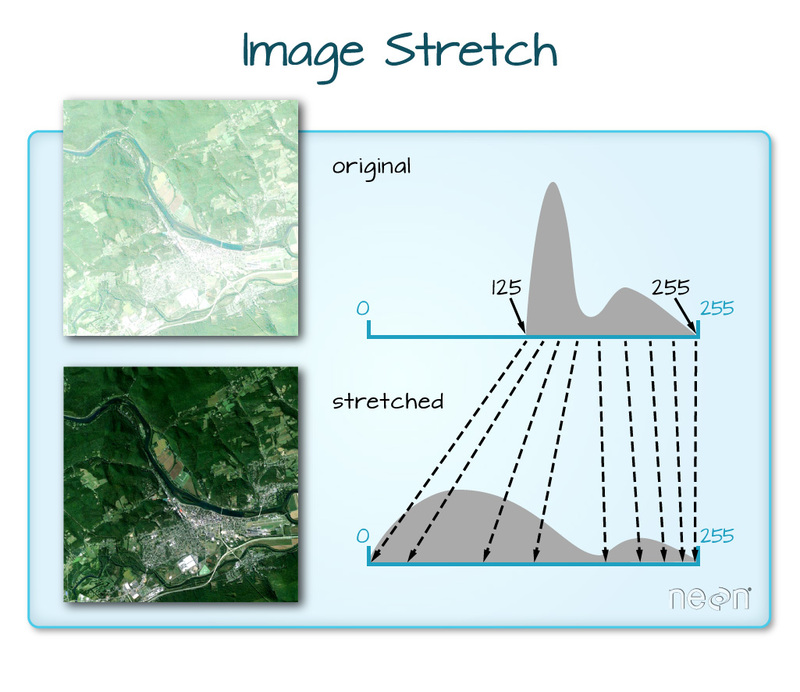 In this case, the stretch doesn’t enhance the contrast our image significantly given the distribution of reflectance (or brightness) values is distributed well between 0 and 255. Let’s explore what happens with NoData values when working with RasterStack objects and using the plotRGB() function. 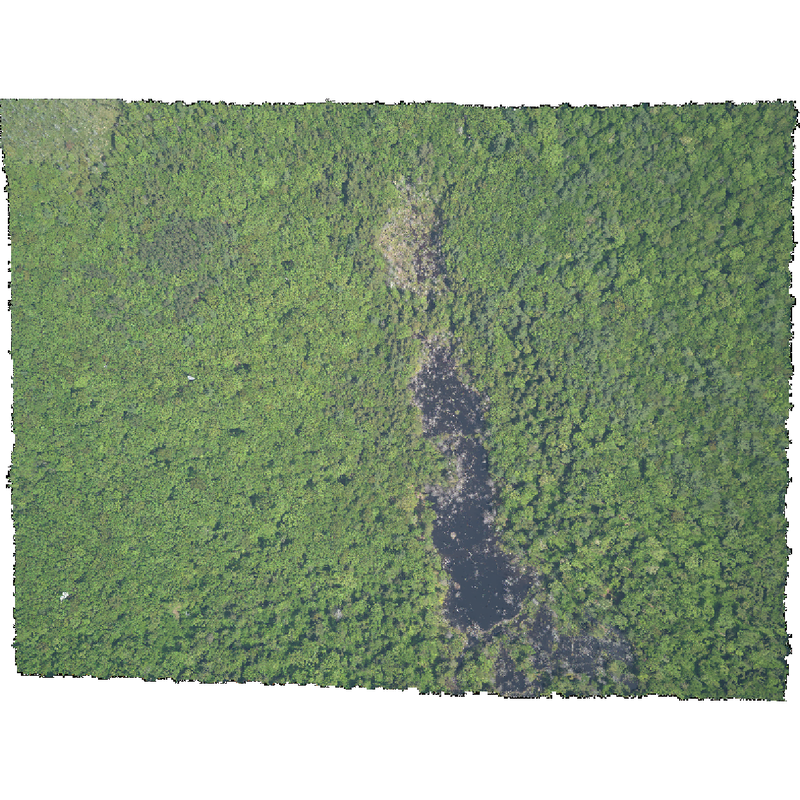 We will use the HARV_Ortho_wNA.tif GeoTIFF file in the NEON-DS-Airborne-Remote-Sensing/HARVRGB_Imagery/ directory. View the files attributes. Are there NoData values assigned for this file? If so, what is the NoData Value? How many bands does it have? 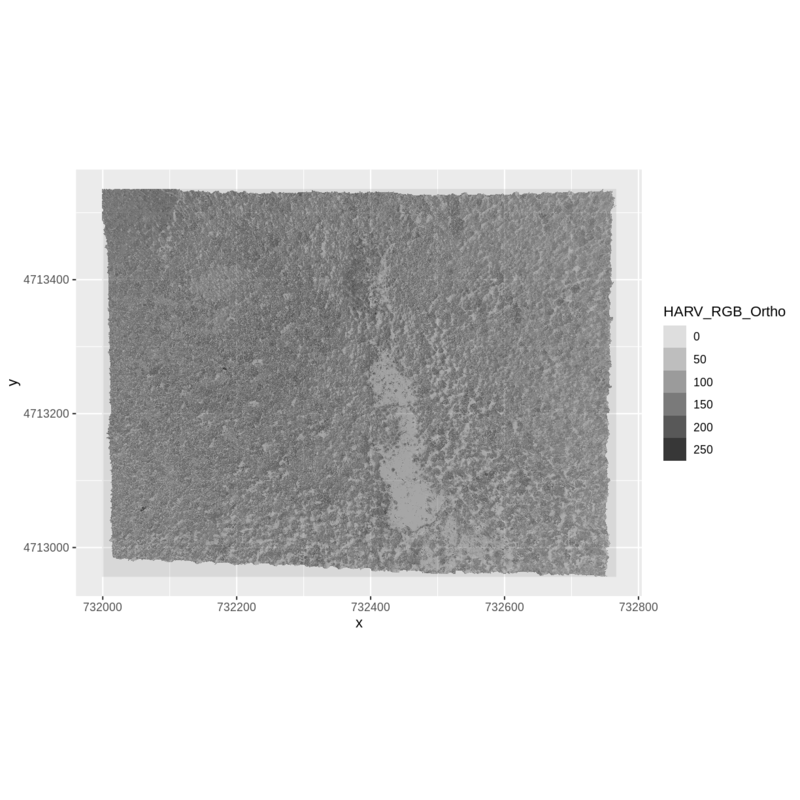 Load the multi-band raster file into R.
Plot the object as a true color image. What happened to the black edges in the data? What does this tell us about the difference in the data structure between HARV_Ortho_wNA.tif and HARV_RGB_Ortho.tif (R object RGB_stack). How can you check? 1) First we use the GDALinfo() function to view the data attributes. 2) From the output above, we see that there are NoData values and they are assigned the value of -9999. 3) The data has three bands. 6) The black edges are not plotted. 7) Both data sets have NoData values, however, in the RGB_stack the NoData value is not defined in the tiff tags, thus R renders them as black as the reflectance values are 0. The black edges in the other file are defined as -9999 and R renders them as NA. We can create a RasterStack from several, individual single-band GeoTIFFs too. We will do this in a later episode, Raster Time Series Data in R.
The R RasterStack and RasterBrick object types can both store multiple bands. However, how they store each band is different. The bands in a RasterStack are stored as links to raster data that is located somewhere on our computer. A RasterBrick contains all of the objects stored within the actual R object. In most cases, we can work with a RasterBrick in the same way we might work with a RasterStack. However a RasterBrick is often more efficient and faster to process - which is important when working with larger files. You can read the help for the brick() function by typing ?brick. Notice that in the RasterBrick, all of the bands are stored within the actual object. Thus, the RasterBrick object size is much larger than the RasterStack object. Challenge: What Functions Can Be Used on an R Object of a particular class? What methods can be used on the RGB_stack_HARV object? What methods can be used on a single band within RGB_stack_HARV? Why do you think there is a difference? 3) There are far more thing one could or wants to ask of a full stack than of a single band.